An exceptional offering from the pre-war era, depicting on the games all-time greatest immortals in his only mainstream cabinet card of the era. Wagner did not receive representation in the far more common T3 production, but thankfully was included in this far rarer M110 premium. 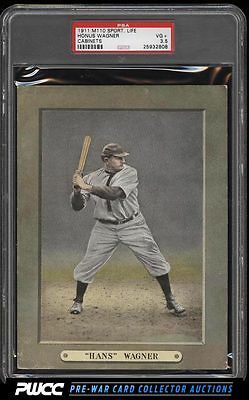 To date this is the single finest copy to ever hit the eBay marketplace is only eclipsed by a PSA 5 which sold in Heritage for $35,850 over a year prior. Just three total examples grade higher than this lofty VG+ specimen. Very light creasing at the bottom two corners are all that keep this card from receiving an even higher technical assessment. All told this is a world class investment piece from the pre-war era, representing one of the most attractive and yet also highly elusive Wagner productions in the hobby. This comes with our highest recommendation. One of nearly 17,000 cards, lots, and sets up for bid in our 8th Auction of 2016. Click on the link above to view the other PWCC auction lots.